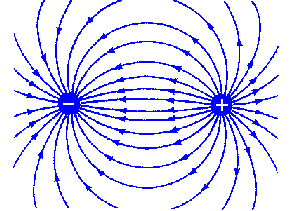 An electric dipole is a separation of positive and negative charges. The simplest example of this is a pair of electric charges of equal magnitude but opposite sign, separated by some (usually small) distance. Dipoles can be characterized by their dipole moment, which is a vector quantity. For the simple electric dipole given above, the electric dipole moment points from the negative charge towards the positive charge, and has a magnitude equal to the strength of each charge times the separation between the charges. Field lines of an electric dipole, separated by a distance d.
An electric field produced by a dipole is known as a dipole field. The direction of is always from negative to positive. The SI unit of a dipole movement is the Coulomb-meter. The perpendicular bisector of l is called the equatorial line. Some of examples of electric dipoles are HCl and H2O. There may be two or more atoms joined to form a single molecule. Every atom consists of a nucleus which is positively charged and electrons which are negatively charged. Both nucleus and electrons are rotating. At the middle of the atom both positive and negative charges coincide which makes an electric dipole moment that is zero. If we place a molecule that has a zero electric dipole moment in an external electrical field, then the charges associated with the electric dipole will be displaced and the molecule will become an electric dipole. Want to know more about electric dipoles? Click here to schedule a live session with an eAge eTutor!